Get the inside story on America’s most powerful political dynasty. Through a series of exclusive, surprisingly candid interviews with members of the family and close friends, the inner workings of this very private family are revealed: their marriages and friendships; the intense sibling rivalry between George W. and Jeb Bush; divisions between father and son over the Iraq war; even Jeb Bush’s plans to run for president in 2008. Never-before-seen private photos add even greater detail and depth to this fascinating family portrait. And above all, we see George W. Bush the way his family does, as an intensely driven person who has a much more complex relationship with his father than has often been portrayed in the media. Family members talk about how he deals with the stresses of the war on terrorism, why he sees it as a “religious war,” and how his personal faith influences what he says and does. The Schweizers also delve into the Bushes’ sensitive and secret business dealings, including their long history of involvement in the oil business. Their shrewd alliances with other American dynasties—including the Kennedys, Rockefellers, and Tafts—have all helped to quietly consolidate their power within the Republican Party. Indeed, what makes the Bushes so successful is that they function less like the great political families before them and more like a high-tech startup: free-flowing, pragmatic, and opportunistic. It is this distinction that assures them an enduring presence on the nation’s political stage, making The Bushes essential reading for anyone who cares about America’s future. We got this book for our 90 year old mother who is a big Bush fan and she was upset by the negative perspectives in this book. I'm already a fan of the Bush politics, so I'm glad to have more knowledge about 5 generations of this incredibly powerful family. The content is interesting, and seems like it came from several in depth interveiws with many of the family members. The book isn't necessarily political, and didn't really sway my feelings for any of the family members either way, except perhaps for Barbara. The only draw back is that this book is a semi-biography, and not independent history, and therefore situations are seen through the Bush perspective....I'm sure some of the left-leaning citizens may not enjoy it much. The book itself is well written. Only a few times did I find myself confused...either the author jumped between time frames, or the CD skipped a little, I'm still not sure which. I'm a Republican, so this insight on the Bush family was delightful. They are definitely not perfect, but are lovable all the same. I learned alot about this dynasty and their role on American history. I really enjoyed reading this book and learned alot about the early Bush/Walker families and how they got to prominence. From this book, it makes you want to read separate biographies about George, Dub-Ya, Barbara and Jeb. There was almost too much information in this book and it did not have the opportunity to go into depth. But, I learned a lot about this family. A good interesting read. 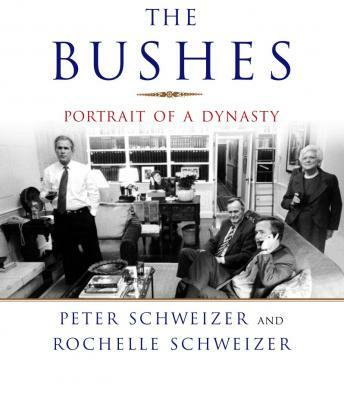 I had little knowledge of the history of the Bush family before listening to this book. I was impressed with the sense of family unity they not only have but continue to cultivate. Being a high profile family full of strong minded people cannot be easy to be a part of yet there seems to be a balance of dedication to family ideals and the fostering of individualism. I now see the Bush family with a little more understanding for who they are as people not just piblic figures. This book is worth listening to it. It allows the reader to gain a more insightful view of the first family. Quite interesting and made my drives to and from work seem a lot shorter. After finishing the book, I must admit that I came away with a better respect for the Bushes.